More than sweet I like savoury cookies and the fact that it goes well with tea/coffee is only plus point so when I saw Barley Buttermilk Biscuits in Gayathri blog I decided to give a try as I had to open my barley flour packet :). I started my work but only to realize I didn't few things mention in the recipe . :( but then that didn't stop me from trying it and I came up with my own. These is one of those most simple and quick cookie which taste good and spicy, avoid chili powder if you don't like spicy stuff or making for kids. Also these cookies are towards the crunchy side and not soft, if you want soft cookies then add butter :). Thanks to Gayathri for sharing such wonderful recipe. 1. Sieve together all the flours, baking, cumin, garlic, chili powders and salt and preheat the oven to 180C/356F. 2. Meanwhile roast kasoori methi for a mintues and crush with your palms and add in the flour mix. 3. Add butter or oil and mix well until flour becomes crumbles. 4. Add milk and make a soft and smooth dough. Try not to have any cracks, add more milk if required. 5. Roll into thin layer and cut in desire shape with a cookie cutter. You can keep the thickness to 1/4cm, I prefer to have thin cookies. 6. Bake for 15-18 minutes or until golden brown. Keep eye on oven after 15 minutes. Remove and cool on wire rack and store in air tight container. The cookies are real crispy and stays the same for weeks. As said add 1/4 C butter if you wish to have it softer. Healthy cookies,love the shapes...I always love the savory version.Delicious cookies. I love savory biscuit,have to try,never bought barley though so far..
Woww.. cuter and healthy cookies.. looks absolutely awesome dear.. thanks for sharing !! Cookies looks cute...Sounds delicious with only 2 tblspn of butter. 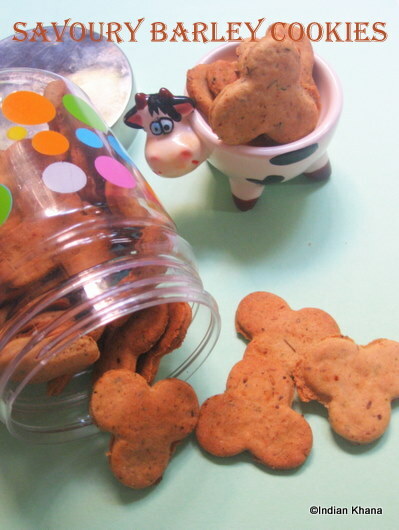 nice and yummy spicy cookies..
cute shapes!!!!! Looks like flavourful Cookie!!!! Cute shaped cookies.Looks so nice. Those r very cute shaped ones...u dunked them in tea??? wow, they looks so cute..love the shape and the cookies look delicious..
very interesting cookies! Wish I could taste them! I love these sort of crackers a lot... and by the I am a tea addict.. n that one of yours is forcing me to make some now!!!!! Cookies looks damn cute and marvellous,thanks for sending Priti.. This looks super delicious. Perfect for tea time. Healthy cookies with perfect shape!! I like savory stuffs, this one looks perfect for tea time! Healthy and perfect..Lovely they look! Delicious savory cookies love it. Savory cookies..my favorite. Will go perfectly with a cup of tea !! Cookies are so inviting. Thanks for trying..
so healthy and perfect cookies !! Loved the cookie shape !! Wow cookies with barley.. never heard before ..Sounds interesting..
looks so yummy...perfect for a cup of tea. Love the idea of barley savory cookies !